Producer: The History Channel, 1997. This is a fantastic DVD! 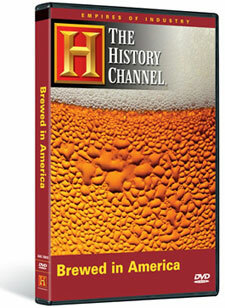 The program tells the storied history of brewing in America, highlighted by interviews with historic brewing families such as Pabst, Coors, and Yuengling. Archivists from Anheuser-Busch, the Miller Brewing Company and others also offer their insights. Illustrated with a steady flow of great photos and archival footage, as well as a look inside various contemporary breweries. Top rating. "Brewing beer is one of humanity's oldest activities, dating back thousands of years before the birth of Christ. When the Puritans first landed on America's shores, they brought recipes and thirst with them. BREWED IN AMERICA is a comprehensive history of an often-overlooked industry that has long been a mainstay of the American economy. Extensive interviews with industry insiders including Richard Yuengling (president of the oldest brewery in America), August Pabst and William Coors provide a privileged view of their companies. Anheuser-Busch corporate historian Dr. William Vollmar details the impact and legacy of social movements like Temperance and Prohibition on American brewing, and visits to breweries show how beer is made today, from craft-brewing to corporate giants like Miller. And explore the massive impact that advertising has had in shaping the modern brewing industry. From the original Sam Adams to Carrie Nation to Bud Light, this is the fascinating history of BREWED IN AMERICA."